Listen … I made a post on Facebook a few days ago that said, God still has time to blow your mind in 2016. Well, let me testify. On yesterday I was checking my email and there was an email with the subject “Kisha’s Daily Devotional Blog in Feedspot Top 30 Devotional Blogs.” I clicked on it and I was indeed among the list as being one of the top 30 devotional blogs on the internet. Wow!! 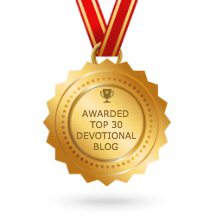 My blog, https://kishasdailydevotional.com/ has been selected as one of the top 30 Devotional Blogs on the Internet! Y’all! #nowords I told you God still has time to blow your mind in 2016! WOW!! Check it out. I got a cool badge and everything. And I must say, I am among some awesome blogs! You’ve got to check it out for yourself. Visit them at blog.feedspot.com and see the list. It’s going to blow your mind as well. I’m sharing this because somebody is doubting that God can do it. If you need another testimony, I got a text from my best friend, on last night, who said she got a call yesterday for another job that starts on 1/16/17. Baby, you can’t tell me what God can’t do. All you have to do is believe. Thank you God and thank each of you who follow my devotionals. Please don’t stop. Share it with somebody and check out feedspot and show them some love. God is amazing and He still has time to blow your mind. Do you believe? Next Post Help send my niece to Italy……. Congratulations Keisha! May god continue to bless you in your endeavors.